PAWTUCKET, R.I. - The Pawtucket Red Sox (4-3) opened their 2019 home slate at McCoy Stadium with a victory over the Syracuse Mets (5-3) by a final of 3-2. 13 Red Sox players and staff members received World Series rings as part of the Opening Day pregame ceremonies, which also included honor guards from the city, the state, and the region. New England Patriots special teams captain and three-time Super Bowl champion Matthew Slater was also on hand to help hand out the championship rings. 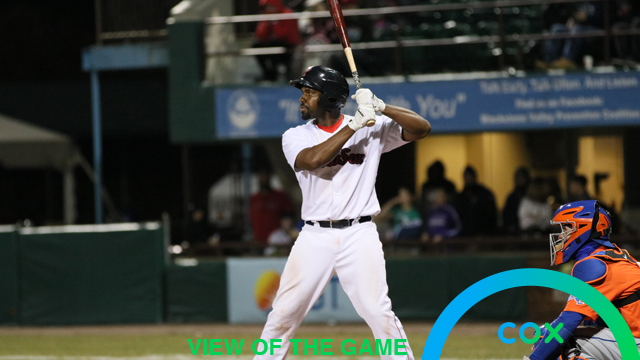 The PawSox jumped out to a 2-0 in the second inning thanks to back-to-back home runs from Josh Ockimey (1-for-2, HR, 2 BB) and Bryce Brentz (1-for-4, HR), the latter of whom led the International League in long balls in 2017. The Mets responded with a pair of runs in the eighth inning when Gregor Blanco (0-for-3, RBI) drove in a run after reaching on an error. Danny Espinosa (1-for-4, RBI) then lined an RBI single to left to make it 3-2 Pawtucket. Jenrry Mejia entered the game with two men in scoring position and two out and struck out Adeiny Hechavarria on three pitches. In his second start of the season, Pawtucket right-hander Erasmo Ramirez (1-0) tossed 6 scoreless innings, striking out 5 and allowing just 3 hits without walking a batter. After allowing a lead-off single to Carlos Gomez in the first inning, Ramirez then set down ten batters in a row. Playing his first game at McCoy Stadium, Mets left fielder Tim Tebow went 0-3 with a walk. The PawSox continue their seven-game homestand on Friday at 6:05 p.m. Pawtucket right-hander Chandler Shepherd (0-1, 720 ERA) is scheduled to oppose Mets righty Drew Gagnon (0-0, 0.00 ERA). The game will be televised live on Yurview on Cox, and radio coverage on WHJJ (920 AM and 104.7 FM) and throughout the PawSox Radio Network begins with the pre-game show at 5:35 p.m. The four game series at McCoy Stadium runs Thursday-Sunday (April 11-14). Good tickets are available, and fans can visit the McCoy Stadium box office, which is open Monday-Friday from 9 a.m. through 5 p.m., and during all home games. Fans can also call (401) 724-7300 or log on to PawSox.com for tickets.